Jumanji: Welcome to the Jungle now Sony’s highest grossing film of all time! Over thirty years ago, Peter and Judy first found the game—Jumanji—with the instructions that once the game is started, it must be finished or it will go on forever—and it was then, with this same wonderment, readers found Jumanji, too. Since its original publication, Jumanji has been honored with many awards, including the Caldecott Medal, and in 1996, the surreal story was adapted to fit the big screen for the first time. 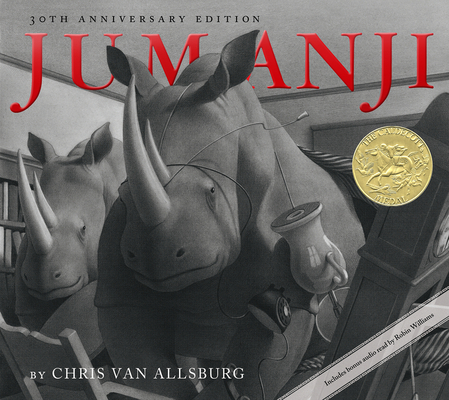 Chris Van Allsburg is the winner of two Caldecott Medals, for Jumanji and The Polar Express, as well as the recipient of a Caldecott Honor Book for The Garden of Abdul Gasazi. The author and illustrator of numerous picture books for children, he has also been awarded the Regina Medal for lifetime achievement in children’s literature. In 1982, Jumanji was nominated for a National Book Award and in 1996, it was made into a popular feature film. Chris Van Allsburg is a former instructor at the Rhode Island School of Design. Visit him at chrisvanallsburg.com.